Did you know that the arts were named a core curriculum subject in Washington state in 1993? This means the arts are recognized as fundamental to basic education, just like math, reading, science and humanities. The Washington State Arts Commission works “to strengthen K-12 arts education as part of, and fundamental to, basic education” across all of Washington state. One of the ways they do this is by supporting local partnerships among arts organizations and schools. 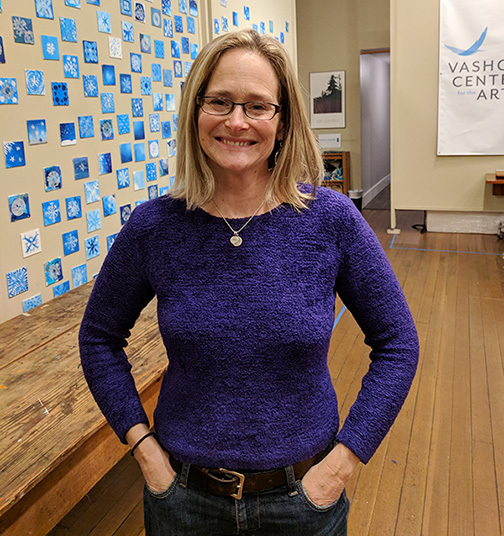 In recognition of the strong partnership we have with Vashon Island School District, Vashon Artists in Schools has been a recipient of this support for 20 years! We use the funding and resources provided by ArtsWA to enhance and enrich the curriculum at Vashon’s schools preK-12th grade each and every year. Funding from ArtsWA comes in a 2-year cycle and we’ve just submitted an application that will take us through the 2020-21 school year. Cross your fingers! VAIS’ first ever ArtBlitz was a success!! Born from a request from Rebecca Goertzel to bring a day of novel arts experiences to students at Chautauqua, Wednesday featured 7 artists across the 5 specialist classrooms at CES doing art ALL DAY! Massive thanks to Shawn Kellogg and Sadie LeDonna (circus arts), Mik Kuhlman (physical theatre), Adam Ende (mask performance), Carolina Silva and Alisara Martin (watercolor), and our very own Maria Glanz (original performance)!! These teaching artists worked with 6 unique groups of students EACH from 9:20 – 3:20 and we’ve heard nothing but rave reviews from students and teachers about the opportunity. Next up, we’re bringing a modified version of this experience to McMurray on April 19th when 18 VAIS artists will run 2-hour workshops concurrently, taking up residence in every nook and cranny of the building. These days were generously sponsored by Vashon Maury PTSA, a longtime partner of VAIS. Thank you! Speaking of ArtBlitz, here’s some news from a happy parent of exhausted kids . . . If that sounds like the kind of fun you wish you had every day, you’re right. And, you’re in luck! Mik will be teaching an Adult Improv class beginning April 17th right here at VCA. Registration is open— check it out here. And while we’re on the subject, actor and director Chris Boscia will be teaching From Page to Stage: Scene Study this spring. This class is designed to help students develop their craft—focusing on short scenes to uncover opportunities in the text. Scene Study is open to students 16 years and up—and begins April 2nd, running through June 11th. Register online hereor give the Blue Heron a call . . . (206) 259-3005. The office is open Monday through Friday, noon to 6pm! Need help with a scholarship? Click here. I’ve been posting steadily these past two weeks, pretty much everywhere I could, about the emerging and converging Original Worksdance concert. The lovely preview in this week’sBeachcomber (Beachwrap?) says it all . . . The stage is set. The dancers are ready. All we need is you! Get your tickets here. And lo and behold, before we could come up with a logo, a program precis, or anything more concrete than a wisp of a notion, the piano spirits smiled and delivered us yet another young piano master to VCA, another international sensation called Albert Cano Smit. And now this note . . . The author should be forgiven that last bit of hyperbole. Our resident Music History maven, Michael Tracy (who is himself presenting a can’t-miss Debussy lecture and recital on March 31) found Albert and made the overtures that wound up bringing him to us. But I digress. Returning to the narrative . . .
What we officially know about Albert is that he won 1st place in the 2017 Naumberg Piano Competition in NYC, one of the oldest and most celebrated music competitions in the world. There’s more, but really, what else do you need to know? Tickets will go on sale soon. In the meantime, give a listen . . . and realize you can hear him live, no ferry ticket or airfare required, in our very own Kay White Hall on Friday, April 26th. I don’t do this enough . . . thank Voice of Vashon for all they do for our community, and for all they do for VCA. These great folks, and it’s a ton of love and volunteering, tell our stories, play the soundtracks of our lives, interview the people who are doing great work in our community, comment with great good humor on what’s doing and what’s not, record PSAs, video us at work and play . . . the list goes on and on. If you’re not listening in from time to time, well you should. And when Rik Wallace is out selling raffle tickets (and it must be getting time for that again! ), buy some! This past week VCA has benefitted at least twice that I know of from VOV love and support. The second is a wonderful interview with Wendy Finkleman, our Director of Arts Education did with Peggy Rubens-Ellis and Woody Pollock. The other thing is actually a collaboration between Jeff Hoyt and our own Joseph Panzetta. I never get tired of listening to Jeff’s voice and am grateful every time I hear a PSA from him. Joe laid over some nice graphics and a bit of Jovino’s music to really round things out. So, thank you, thank you, thank you to our colleagues and friends at VOV. Rock on!!! And yes, a little reminder, we have good seats available. I went across town on Wednesday, avoiding the Ferry System, to attend the annual ArtsFund luncheon, there to schmooze, dine, and listen with 850 PNW arts supporters and supporteds. Some years ago, I was on that board and it was fun to attend from the opposite perspective. Three things stand out . . . The first was some highlights from their landmark Social Impact Study. The report observes that . . . This last statistic lands with a thud. The report goes on to vigorously make the case for the impact of the arts in the affirmative. But the seed of doubt has long ago been sown, and I take it as a reminder and a call for VCA to more firmly take on board how we can more directly and specifically link our purpose to promoting deeper human connection and caring for our island and our world. Speaking directly to this point was the second standout moment, comments by a man named Stanford Thomas, a young(ish) trumpet player of considerable skill who has applied himself to music and social change. From his website . . .
Born and raised in a musical family, I began playing trumpet at the age of 8 and studied with members of the Georgia State University faculty and Atlanta Symphony Orchestra. After implementing several successful entrepreneurial ventures as a child, I grew more interested in combining my musical talents and interests in business to build various social projects. In 2010, I founded the El-Sistema-inspired program Play On, Philly! where I currently serve as Executive Director and have secured over $12 million in funding which has impacted the lives of hundreds of children in Philadelphia. His TEDtalk is inspiring and says it all. The third was the rapture of listening to Maiah Wynne sing. I’ll let these clips speak for themselves. The first is the song we heard and loved.